Callas, Baum, Simionato, Weede, Moscona, Ruffino, Sagarminaga; Picco. 1950. Downloadable .M4A or .MP3 files. Total size: approx. 260MB. New! 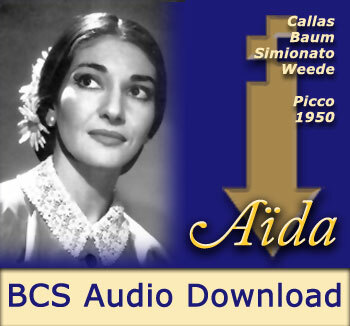 Save when ordering this title as part of our 5 Callas Operas value set! Stefan Zucker: How were relations between Callas and Kurt Baum [who sang with her in Mexico]? Giulietta Simionato: [Laughs.] Terrible! They disagreed about everything and always were fighting. He was jealous because, when they sang Aïda, she interpolated a high E [E-flat] in the concertato, saying that [Angela] Peralta, a celebrated nineteenth-century soprano, had sung it. And the director of the theater said, “Yes, yes, sing it. Peralta also sang it. But don’t tell Maestro Serafin. He’d kill me.” It was in questionable taste. That man, Baum, was furious because she had an enormous success with that E [laughs]. He stepped on the train of her costume, to prevent her from moving forward, and she was rabid–RABID. SZ: But not to the point of refusing to sing with him. GS: No, no. They were there–they had to sing together. She didn’t refuse. He didn’t refuse either. However they were enemies. 22. Ma che veggo! Egli? Mio padre!